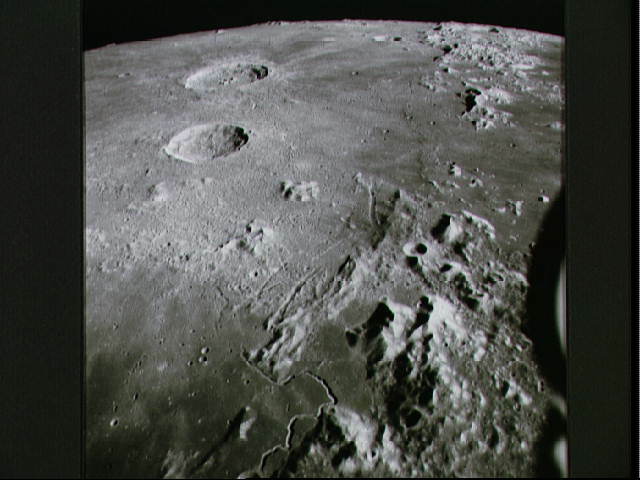 An oblique view of the Hadley-Apennine area, looking north, as photographed by the Fairchild metric camera in the SIM bay of the Apollo 15 Command/Service Module in lunar orbit. Hadley Rille meanders through the lower center of the picture. The Apennine Mountains are at lower right. The Apollo 15 Lunar Module touchdown point is on the east side of the "chicken beak" of Hadley Rille. The Caucasus Mountains are at upper right. The dark mare area at the extreme upper right is a portion of the Sea of Serenity. The Marsh of Decay is at lower left. The large crater near the horizon is Aristillus, which is about 55 kilometers (34.18 statute miles) in diameter. The crater just to the south of Aristillus is Autolycus, which is about 40 kilometers (35 statute miles) in diameter. The crater Cassini is barely visible on the horizon at upper right.